Octodad Interview - Loving Father. Caring Husband. Secret Octopus. After digging into the demo at PAX East, I decided I wanted to get in touch with someone from the Octodad: Dadliest Catch team to talk more about the project and its development. A few emails with Young Horses’ CEO and Community Manager Phil Tibitoski lead me to Kevin Geisler. Kevin Geisler is a Producer and Programmer at Young Horses working on Octodad: Dadliest Catch. Dadliest Catch is the official sequel to the original Octodad, a game that started out as a student project at DePaul University in Chicago, IL. Mr. Geisler was kind enough to sit down and chat with me about this crazy game and how things are moving along in regards to its development. What is Octodad: Dadliest Catch? Octodad is a strange beast. In this game, players play an Octopus who is husband to a human wife and father to human children. They must use unique controls to move Octodad about a single day, with flashbacks, while concealing the fact that he’s an octopus from his family. Limbs are controlled independently, so walking and interacting with objects in the environment is deliberately challenging. That translates to a really unique take on in-game mechanics. So, for instance, slipping a wedding ring onto your patient future wife’s finger is cause for hilarity, alarm and challenge. “We decided to actually try to do something with it.” There were 18 or 19 people working on the game, and they needed to scale that back in order to make the future Octodad: Dadliest Catch a manageable thing. So, they did, and that’s how they formed Young Horses. But, more on that in a bit. 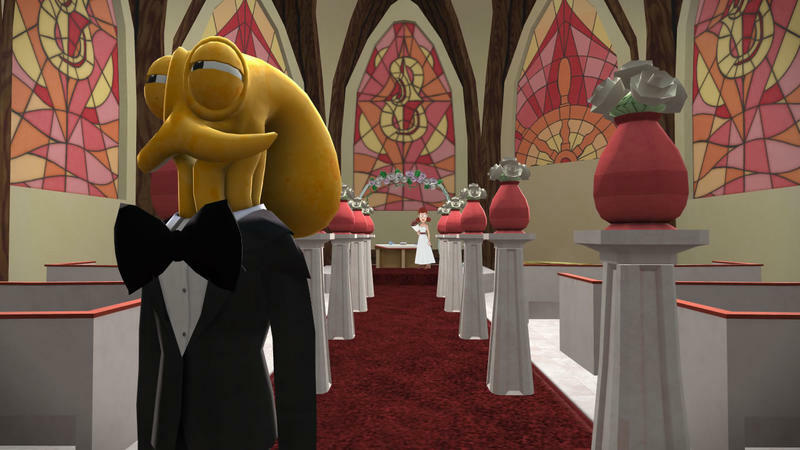 Octodad: Dadliest Catch will have a complete story. 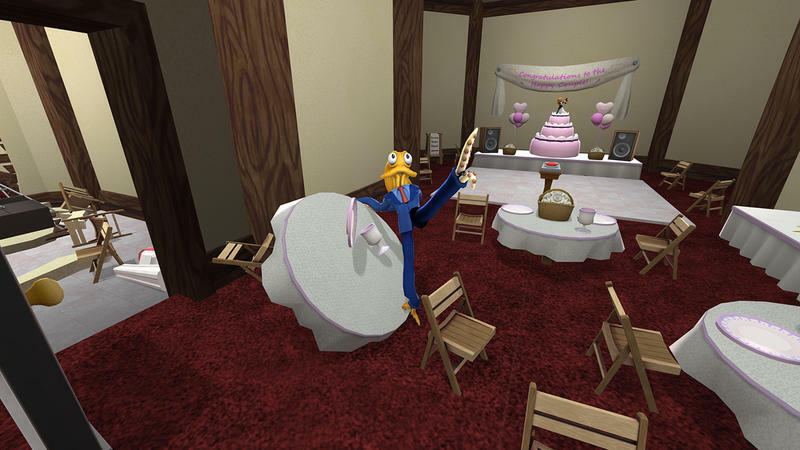 The team will explore a full day in Octodad’s life. They will investigate his backstory and force him, and gamers, to visit an aquarium with his family. Octodad is an imposter. He wants the life of a human, he wants the love of a wife and he wants to watch his children grow up. 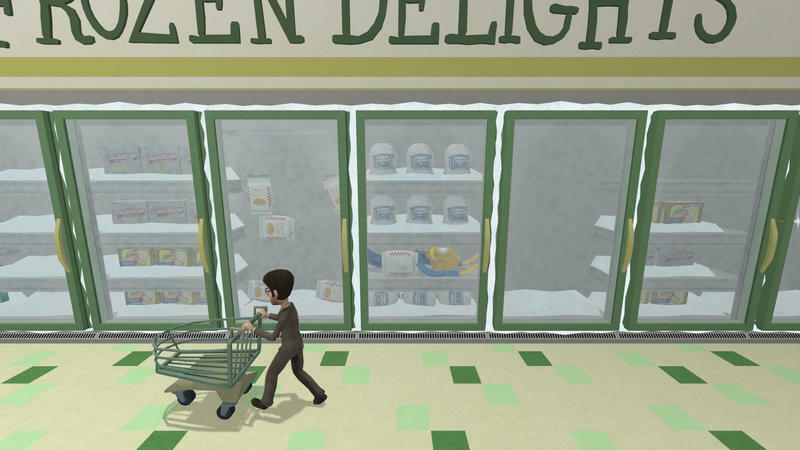 To earn those seemingly simple things, Octodad has to go to great lengths of pretending. Just like Octodad’s personal fear of being outed, Geisler shared with me that the Young Horses team feels sort of the same way. We’ll touch on this again later, but Geisler says that “we’ve got this imposter’s syndrome going on: are we actually good enough to make this game?” That line connects the hopeful developers to the hopeful human protagonist of Dadliest Catch. Is he good enough to fool his family into loving him, and are these young programmers, writers and artists good enough to share a genuine version of their vision with gamers? We’ve got this imposter’s syndrome going on: are we actually good enough to make this game? Insert your best Friends joke here. “And then two others live probably about 10 to 20 minutes away, still in Chicago. Then we have one other, our Sound Artist, who lives in Ottawa, IL, which is a few hours from Chicago.” These are all young guys with, as Geisler told me, an average age of about 24 or 25. Apart from Geisler’s personal experience as an intern at Activision, they don’t have much when it comes to time spent developing and shipping commercial games. That’s where the fear comes in. If there’s one big thing that I gleaned from Geisler during our discussion about what Young Horses is concerned over, it’s that Octodad: Dadliest Catch simply won’t catch on. Geisler explained that the team making the game represents a very specific slice of the gaming world. He explained that they’re all young, dedicated gamers, but that they are making Octodad for everyone. “We lucked out pretty well with [Kickstarter],” Geisler said of the game’s successful funding on the platform that helps indies get to work on whatever it is they’re selling. Octodad’s sequel ran on Kickstarter before Double Fine broke the mold and shattered records with their adventure game, so the Young Horses team was ecstatic by the fans who backed the game and brought them over their $20,000 goal. $24,000, the number they actually hit, might not sound like much when it comes to making a game. However, Kickstarter was about more than just the money earned. 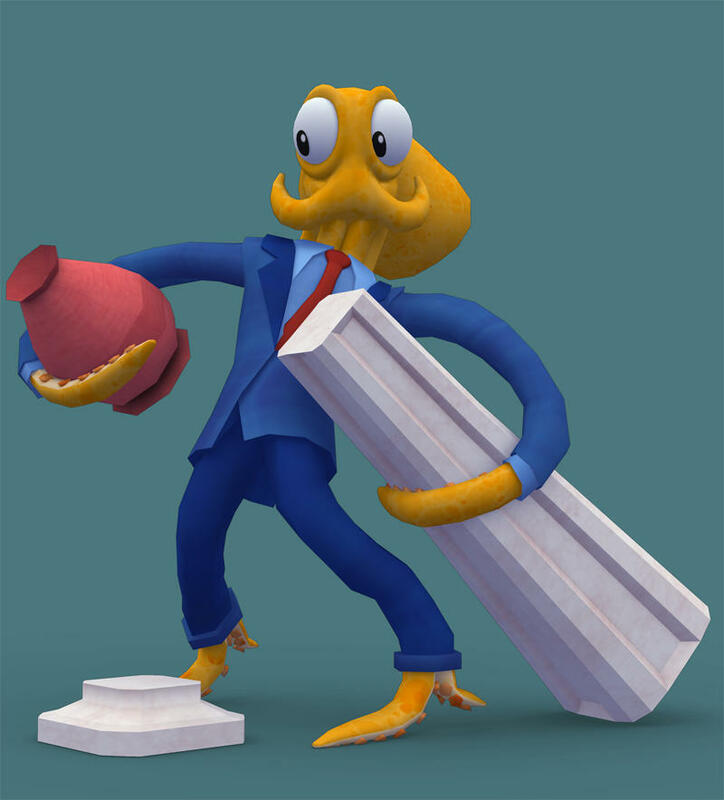 Kickstarter helped build a community for Octodad, especially as their project garnered support from more famous indie developers like Markus “Notch” Persson of Minecraft and Mojang fame. While Geisler put nothing but modesty on display, I asserted that there’s really a special buzz surrounding Octodad: Deadliest Catch. These are my words, not his, but I genuinely think that the Young Horses team is onto something seriously special. Octodad is a concept with some interesting layers to it. It’s a straightforward game with unique controls, it delivers a huge dose of humor and it’s unlike anything else being developed.Young Horses might be afraid that Octodad: Dadliest Catch will suffer the fate of being a far too inside joke, but I sit on the opposite end of the spectrum: this game is hilarious, and everyone thinks so. 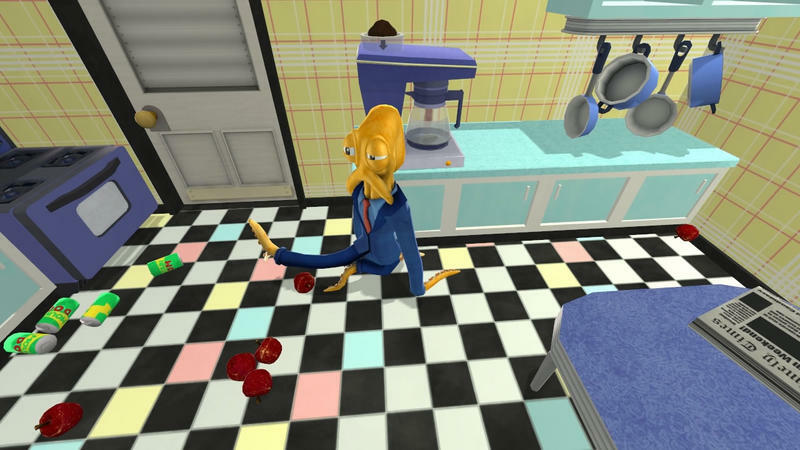 Octodad: Dadliest Catch is being built in order to make people happy. Young Horses have January of 2014 on their calendars as a potential release window, but Geisler told me that locking down a date has been tough. While January is hopefully the latest date for the game’s release, Geisler said he doesn’t want to disappoint fans with a missed release window. On a personal note, I’m really looking forward to Octodad: Dadliest Catch. While playing the game at PAX East, watching its trailers and flipping through its screenshots, I found myself sporting the goofiest smile ever. That, to me, is a really good sign. 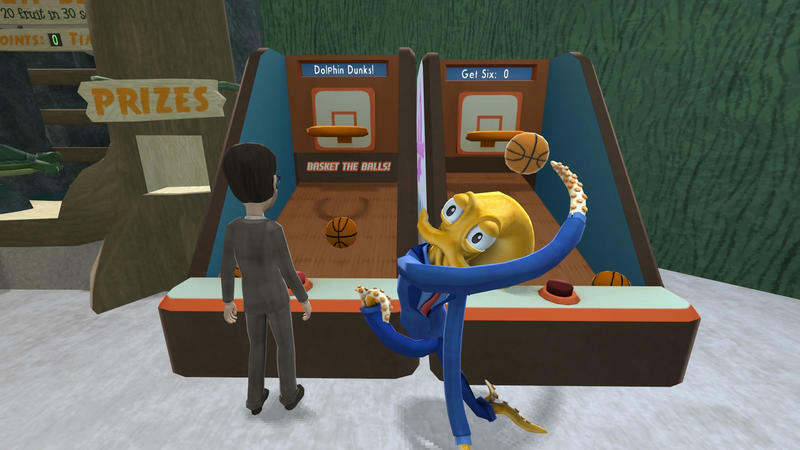 You can learn more about Octodad: Dadliest Catch by heading to the game’s official site.